Seeing Eye Lighting Design Turns to 4Wall to Light 4th Annual Oculus Connect Conference | Press Center | 4Wall Entertainment, Inc.
San Jose, CA- Oculus Connect (OC4) brings together the best VR creators, developers, and pioneers under one roof for a 2-day conference where attendees explore groundbreaking new VR applications and technology. Event Producer FNTECH chose Seeing Eye Lighting Design and Principal Lighting Designer Paul Efron to light the 4th annual event utilizing gear from 4Wall Entertainment. The conference was broken up into multiple areas that included a general session, numerous breakout tracks, an exhibit hall, and demos throughout the San Jose McEnery Convention Center. 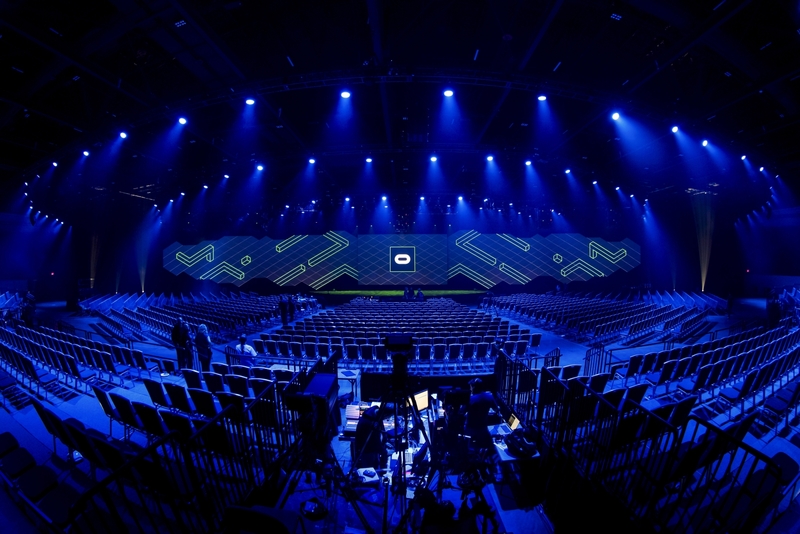 "One of the biggest challenges was the fact that this event was the first of two back to back events for our client FNTECH in the same venue," explained LD Paul Efron. "The schedule dictated that the rigs we designed needed to be installed at the same time to make the changeover possible." Efron designed a system that could easily be repurposed to deliver two unique designs in the same space extremely efficiently. The OC4 general session rig was used for both the keynote and for an exciting eSports event later that evening. The exhibit hall supported a variety of hands-on activations that required unique and specialized lighting treatments. "The ETC Source Four LED Daylight fixtures were used to supply the core of our key light needs in the general session hall," said Efron. "Their ability to dial in color temperature along with their more than ample output, delivered excellent broadcast quality light." Martin MAC Aura XB fixtures provided house light and effects in the general session. Additional trusses with Aura XBs overflowed into the exhibit hall where they provided lighting for various activations. The compact and versatile Robe Pointes were used in the general session for visual effects and Robe BMFL Blades were deployed in the exhibit hall to light large scenic panels at a short throw. "The Blades ample output, accurate shuttering, and wide zoom capability proved essential in providing both the desired effects and the flexibility to be repurposed quickly," explained the LD. A TV/Film lighting package was also in order for OC4. 4Wall provided Kino Flo Celeb 201s & 401s along with ARRI SkyPanel S60-C LEDs for interactive VR green screen activations known as the mixed media booths. Efron spoke on the service 4Wall provided. "As always, 4Wall provided excellent support and flexibility to adapt as needed, leading to two very successful back to back events." For more information on Seeing Eye Lighting Design, visit http://www.se-ld.com and on Facebook. 66 - Chroma-Q Color Force II 72"